A nation in flux - What next for Cuba? Less than a year after Barack Obama restored ties with Cuba, President Trump suspended them – putting the tricky US-Cuban relationship back on tenterhooks. Either way Cuba is under going significant change as the Communist government experiments with market style reforms. We travel across the country from the backstreets of Havana to the tobacco plantations of Vinales, where farming has remained unchanged for centuries. We meet with Cubans from all backgrounds and speak to some of the most senior commentators in the country. US customers are permitted to travel on this tour. Cuba’s long awaited rapprochement with the United States is under threat as President Trump has rolled back the opening up of ties introduced by his predecessor. Our tour examines all aspects of Cuban society, its politics, and recent history as it enters this uncertain period. From the backstreets of Havana to the private tobacco plantations of Viñales, where farming has remained unchanged for centuries, we’ll travel across the island looking at Cuba’s experiments with the market economy. We’ll speak to some of the island’s most senior independent commentators and experts. And we’ll engage in a full itinerary of activities designed for visitors to learn from and directly support the Cuban people. The Cuban government has opted for political continuity while introducing limited free-market reforms. Ordinary Cubans hanker for greater opportunities, but also want to hold onto the social benefits delivered by the Revolution. The tour is led by Michael Bustamante, a Cuban-American and Miami-based academic, and Claire Boobbyer, journalist and author of the Frommers Guide to Cuba. Both have worked in Cuba for over a decade. We talk with international journalists, Cuban academics, independent artists, small business owners, and, above all, ordinary people. We grapple with the issues Cubans face daily and support their enterprises. Key speakers include the FT & Reuters Correspondent, Marc Frank, who is widely regarded as the best international political analyst on the island. The tour includes all transport, accommodations, as well as dining in privately-run local restaurants. How will the Revolution confront renewed tensions with its old foe the United States? Join us to gain in-depth and unique insights into this fascinating island state. As with all of our expert-led tours, we ensure that our groups remain small and intimate, and will not exceed 14 people. Flights to Cuba aren’t included in the tour price and should be arranged by customers themselves or with an agent. 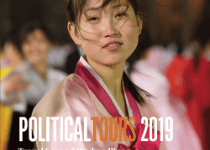 As with all of our tours, the itinerary focuses on current affairs. Dynamic conditions on the ground may lead us to adjust the final schedule. Meet at 6.30pm for an introduction to the week ahead with Michael Bustamante and Claire Boobbyer. Dinner at a local café. Overnight in Havana. Breakfast before a walking tour of Old Havana with a local architect, who has helped to restore the historic areas of the city. We explore the city’s history, efforts to restore it, and the impact on the local population. We’ll hear how Fidel Castro came to power, and how the government has endured since the collapse of the Soviet Union almost thirty years ago. After a tapas lunch, we meet with a leading Cuban economist for a discussion of the challenges Cuba’s economy faces as it opens up to the world. We then take a ferry across the Bay of Havana, accompanied by one of Cuba’s foremost experts on race relations. We visit Regla, a focal point for the Afro-Cuban religions of Santería and the all-male secret Abakua brotherhood. Overnight in Havana. We head out early to Viñales, a small town in the west of the island that is home to fruit and vegetable farming, and more famously the island’s tobacco plantations. Most things here are still farmed by hand. Will that change? We’ll meet with local farmers in an ‘Eco Community’ for an overview of Cuban agriculture, including a visit to their local store and health clinic. Lunch is at the island’s only authentic vegetarian restaurant, where the owner is a slow food champion and helps to train local youth to become waiters and chefs. Homestay with local families all five minutes walk from the main street in town.Overnight in Viñales. Breakfast in your own homestay provides a great chance to find out about everyday life in Cuba and interact with Cuban citizens. We drive south to visit one of the island’s most beautiful tobacco plantations which produces some of the best leaves in the country. We meet with local farmers, enjoy a cigar rolling class and lunch. We cap off the day by meeting a historian of the region to hear about local issues, historical and agricultural, and sustainable tourism. Optional night out for those interested in listening to live music. Overnight in Viñales. The tour includes all of your accommodation, meals with water, as well as local transport whilst on tour. You are accompanied throughout the tour, including at meals, by your leader and Political Tours team. All meetings with various speakers and guests are included. On any tour you meet numerous different speakers giving you access to all sides of the story. 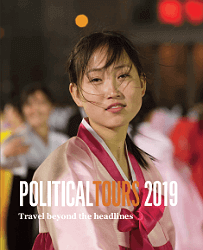 We give you access to political experts, as well as getting to see ordinary life and meet real people in areas less often travelled by tourists. The tour excludes any flights, visas, transfers from/to the airport, alcohol/other drinks, as well as any of your personal expenses. Stays in fours star hotels and hand-picked casa particulares. Yes a Visa or Tourist Card is required for entry to Cuba. You can get the Tourist Card or Visa needed prior to travel from your nearest Cuban Embassy in person, or from various agencies via post and online applications. It is easy to get. It is a loose bit of paper with identical left and right sides. It does not get stuck in your passport and is more of a tourist card then a visa. They take one side when you enter the country and the other when you exit. Take a paper clip to keep the exit part in your passport safely! If you wish to go yourself to the Cuban Embassy in London, the process should take about an hour for you to queue and hand in what is needed. You will get your Tourist Card at the embassy on the day you apply, within an hour or so and do not need to leave your passport. We have used the visa agency “Cubaism” for those unable to go to the Embassy themselves. They will send you a Tourist Card by post, or you can collect it in Battersea. You will need to fill in your information online on their website, make an electronic payment and a send a scanned copy of your passport via email. This is the easiest option. Cuba operates a dual currency system. Visitors usually use the Cuban Convertible Peso (CUC), whereas locals use the Cuban Peso (CUP). The CUP is worth much less than the CUC; check transaction sums carefully. US dollars aren’t accepted as legal tender; you’ll be charged 10% commission to exchange them. Check with your bank before you travel to confirm that your debit, credit and ATM cards will work in Cuba. If your bank can’t confirm this then you should bring sterling or euros in cash, or travellers cheques. Bank notes should be in good condition with no tears, rips or markings. American Express travellers cheques aren’t accepted in Cuba. The climate is a hot, and sub-tropical all year. Most rain falls between May and October and the hurricane season officially runs from July to November. Humidity varies between 75% and 95%. There are no specific dress requirements in Cuba. It is generally warm and humid in Cuba so light clothing is recommended. Weather is changeable so a light jacket or cardigan for when it is cooler and a rain jacket is useful as showers do occur. Most important is to have comfortable shoes. Women: You will need some smarter attire for one or two meetings. Electricity is the North American 2 flat pin and 110v, but most hotels offer 220v. Michael J. Bustamante, Ph.D. (Yale University, 2016) is Assistant Professor of Latin American History at Florida International University, specializing in modern Cuba, Cuban-America, and the Caribbean. Dr. Bustamante’s current book project, “Cuban Counterpoints: Memory Struggles in Revolution and Exile,” tracks clashes over Cuban collective and historical memory, on and off the island, in the wake of the 1959 Revolution. His scholarly writings have appeared in Journal of American Ethnic History, Latino Studies, Cuban Studies, and Perspectives on History, among other publications. With Jennifer Lambe (Brown University), he is co-editor of the volume “New Histories of the Cuban Revolution,” currently under review with Duke University Press. Claire Boobbyer is a travel writer and Cuba travel expert. She has been exploring the island for more than 16 years and writes features on Cuba’s culture, nature, history and tourism for the international press. She has written Cuba travel articles for Condé Nast Traveller, the Guardian, the Telegraph, the Independent, National Geographic Traveller, Time Out, and Skift, among others. She is also the author of Frommer’s Easyguide to Cuba. Claire also works as a tour leader, guide, and translator in Cuba. Why travel to Cuba now? These are only some of the stereotypes that come to mind when one thinks of Cuba. But beyond the old cars and clichés lies a society hanging in the balance. Last year, an already retired Fidel Castro died. Raúl Castro is slated to step down in April 2018, leaving behind a decade of significant, if piecemeal, economic reforms. Meanwhile, the process of normalizing relations between the United States and Cuba has faltered. After two years of expanding bilateral ties and rising expectations for islanders and outsiders alike, President Donald Trump has re-tightened the embargo. Cubans are already feeling the effects. In short, just three years after Cuba became globally “in style,” the island is barreling toward an uncertain period of transition. Add in the fact that Cuba’s GDP continues to underperform – despite an unprecedented boom in tourism – and Cuba is facing its most complex external and internal landscape in over ten years. The economic reform agenda has stagnated. Big problems, like a vexing dual currency system, remain unresolved. Cubans, too, are debating the contours of their political future in ways big and small. Economic realities will likely remain the leading drivers of change. But with Cubans no longer as able to migrate to the United States as easily as in the past (thanks to a late Obama administration move to remove a long-standing immigration policy exception), economic pressures could also contribute to new political demands. 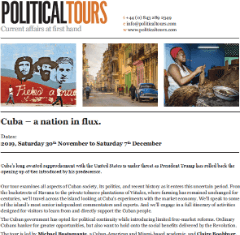 Join Political Tours in 2018 to get an up-close, content-rich look at the Cuba beyond the tourist veneer, the one where real Cubans live, caught between a desire to ward off the worst of what global economic insertion might reap, but also their recognition that continued change must come. Meet economists advising the government on how to strategically open to foreign capital. But also speak with artists serving to remind Cubans of nationalist historical legacies that must not be forgotten. Dine in some of the impressive new small businesses that Cubans have opened over the last five years (working in tough conditions). But also visit local markets and farms to discuss how the pressure to fill tourists’ plates is increasing the price of produce for average citizens. Perhaps most importantly, discuss with a wide range of Cubans just how important the island’s relationship with the United States is or is not to its future, as well as the consequences of renewed confrontation with the North. Last year, Political Tours happened to be on site for Fidel Castro’s memorial. While we cannot promise such a coincidence this year (nor did we in 2016…), the 2018 trip will come just weeks before Raúl Castro retires as head of state. The degree of continuity and/or change to follow remains up for debate. But with Political Tours, you will get a privileged view of what’s at stake. The discovery of Cuba by Christopher Columbus in 1492 and its subsequent colonisation by the Spanish led to the decline of indigenous groups that once populated the Caribbean island. African slaves were brought to the island to work on coffee and sugar plantations with Havana, the capital, providing a base for treasure galleons moving gold between South America and Spain. Despite stamping out several rebellions, the Spanish rulers were overthrown in 1898 following American intervention on the island during the Spanish-American war. The island nation was officially recognized as an independent republic in 1902, though in reality it existed as a United States protectorate for several more years. Cuba attempted to strengthen its democratic institutions with its 1940 constitution – a progressive document providing for land reform, a minimum wage, and public education – though successive corrupt governments, often led by the military, saw little of it implemented. Unrest and instability led to the second coming of Fulgencio Batista, who had served as Cuba’s populist president from 1940 to 1944, but was installed as a US-backed dictator in 1952, having led a military coup on the eve of an election he was sure to lose. His rule was brutal. He suspended the 1940 Constitution he saw written, and cultivated lucrative relationships with American multinationals. In order to quell growing discontent he tightened his grip on the media and ordered his secret police to carry-out torture and public executions of suspected Communists. Meanwhile, the 26th of July Movement – a revolutionary organisation led in absentia by Fidel Castro, who was hiding out in Mexico – was quickly gaining support among rural and poor Cubans who longed for land reform and better living standards. When Castro returned to Cuba with his brother Raul and an Argentine revolutionary, Ernesto “Che” Guevara, after a long military campaign, he finally overthrew Batista and his cronies on January 1st 1959, setting up a Communist government in its stead. The United States attempted to undo the revolution, most notably with the failed invasion of the Bay of Pigs in 1961. Cuban exiles, sponsored by the CIA, landed on the shore south of Havana and initially overwhelmed Castro’s forces but when news of the United States’ involvement became public, support for the operation rapidly dwindled and the invaders retreated, lacking the necessary air and naval support to complete the mission. The failed invasion solidified Castro’s position and contributed to his national appeal, it also strengthened Cuba’s relations with the Soviet Union during the Cold War – the US’ rival superpower. With Soviet support, the Cuban revolution was exported across Latin America from the early 60s to late 80s, with similar Communist rebel groups popping up in Colombia, Mexico and Bolivia, among others. Cold War tensions came to a head for 13 days in October 1962, when the world held its breath as the Soviet Union placed nuclear missiles on Cuba, 90 miles from Florida, both to deter future invasions and in response to the US’ own nuclear escalations in Europe. With full-scale nuclear war looking likely, American and Soviet leaders were able to negotiate a solution to the crisis, with the missiles being removed from Cuba and the US promising not to attempt another Cuban invasion. Cold War crises and historically bad blood, bolstered by a vocal demographic of Batista-allied Cuban exiles living in Florida, US policy towards Cuba has often been punitive. An embargo on Cuban exports and imports as well as a travel ban was put in place shortly after Castro’s takeover. Diplomatic ties were cut. As the Soviet Union fell apart in 1990, Cuba’s economy struggled to make up for the withdrawal of $4 billion in subsidies. Fidel Castro continued to dominate public life, restricting press freedoms and dissent. With Fidel Castro ill, power was transferred to his brother Raul in 2008 who held a more pragmatic approach to leadership, favoring better diplomatic relations with the US and market-oriented economics. Relations with the US began to warm in the early 21st Century, in a phase known as the “Cuban thaw”. Under the policies led by Barack Obama and Raul Castro, diplomatic relations were restored and both countries opened embassies in 2015, though the trade embargo still remains in place. Following a state visit to Cuba, Obama ended the “wet foot dry foot” policy, a policy that granted access to citizenship to Cubans who arrived to the US by foot. The move was praised by Cubans as a step towards normalization. However, following the election of Donald Trump in the US, several components of the Cuban thaw have been halted. In November 2017, Trump announced that business and travel restrictions loosened by Obama’s policies would resume, following an earlier pledge to “cancel” the Cuban thaw. Castro still stands accused of arbitrarily imprisoning his citizens, among other human rights abuses. With many on the island out of work and still living under communist rule – who saw the Cuban thaw as an opportunity for national renewal – the question remains, is Cuba forever at the mercy of its adversary to the north? Single party socialist republic. The Cuban Communist Party (or PCC) is the only permitted political party. Cubans receive free healthcare and education, both considered among the best in Latin America, with state subsidies. One of the poorest in the Caribbean with state wages at around $23 a month. Many people try to migrate to the United States, but recent change of policy in US changes that escape route. Fulgencio Batista: The US-backed dictator who brutally ruled Cuba from 1952 before being overthrown by Fidel Castro’s forces in 1959. He previously served as president from 1940 to 1944. Fidel Castro: The man who led the Cuban revolution who then served as the country’s dictator until 2008. Raul Castro: Fidel’s brother, a senior commander in the revolution and current president having assumed power in 2008. Che Guevara: An Argentine revolutionary who served as Fidel Castro’s second in command during the revolution.